There were 55 entries in today's class, and it was run as a speed class. The course, designed by Olaf Petersen, Jr. of Germany, featured 12 numbered obstacles with three double combinations. 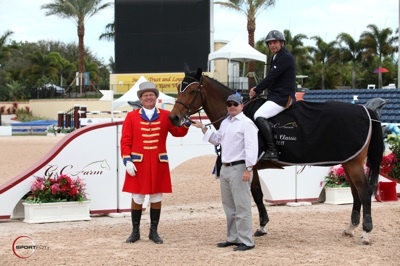 The early leader in the class was G&C Sinatra (owned by Barrios and Gustavo Mirabal) and Pablo Barrios (VEN), who went first and set a time of 67.76 seconds. They would finish in fifth place. As the second to last horse in the ring, Gonzalez of Mexico City, Mexico, set a blistering pace to win in 64.09 seconds. "She's really fast," Gonzalez said. "The combination of verticals that was giving a lot of trouble, was the best for her. You can get there and just let her do it, and she will figure it out. Many people had faults there, but that gave me a chance. She's always really competitive and really fast. If everything goes right, normally she's there." Gonzalez has had Katina, a 10-year-old KWPN mare by Iroko x Ahorn, since she was five years old. While she sold to his client as a six-year-old, he traded back for her when she was seven. 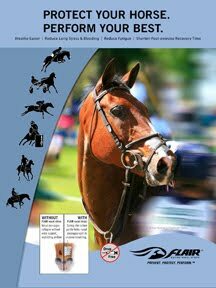 Last year, they won three classes at Spruce Meadows as well as the Mexican Grand Prix Championship. "She's so careful that I had to take my time with her to show her in the bigger classes," he explained. Gonzalez plans to show her in next week's $75,000 FEI Nations Cup, presented by G&C Farm. 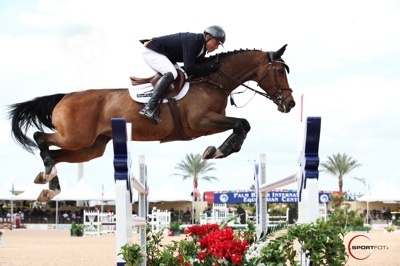 Gonzalez is no stranger to top show jumping competition - he has ridden at the Olympic Games, the World Equestrian Games, and the World Cup Finals. He also served as Mexico's Chef d'Equipe in two Olympic Games and two World Equestrian Games. "I've been around," he said with a smile. "The best thing about this sport is that it gives you a chance with age to learn and learn, and be able to keep doing it even when you are a little bit older." Competing at the top level, Gonzalez feels that the addition of more FEI ROLEX ranking classes is "very important." He continued, "We're at a big disadvantage to European riders because they have so many classes that count for ranking. For us to go up in the world ranking, it's almost impossible. Every time they do something like this, it's super important for us. I really think we should have more like this." This is the first time that Gonzalez has competed at the FTI WEF in 10 years. "I came last year to help some of my students and then I decided that this year that I had good enough horses to be competitive. 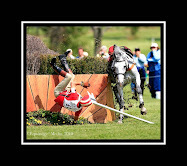 You need to have competitive horses to be able to do something here. For me, it is very important to be here competing with all of these fantastic riders."